Bangalore, February 24, 2017: Fire, deadly desire, iron will and a devil-may-care attitude – that’s what’s in store for you this Saturday as the most widely anticipated season of India’s longest running youth reality show – Roadies – returns for its deadliest season ever! MTV, the iconic youth brand returns with the fourteenth season of the cult reality show, Roadies Rising. Bigger, better and deadlier than ever, this season, aspiring roadies will be seen facing the adventure squad-veteran Roadie, Rannvijay Singha, Bollywood’s lethal combination of beauty with brains, Neha Dhupia, the winning gang leader from last season, Karan Kundrra, reality show king, Prince Narula in multi-city auditions that will be showcased this Saturday, February 25th at 7pm. Adding a layer of mystery and excitement ace Indian off-spinner, Harbhajan Singh will also be seen on the showing bringing some intriguing twists and turns for both – the contestants and the gang leaders! Preparing for a journey down the reincarnation highway, contestants will be faced with the ultimate test of courage and bravery as they set out on an experience of a lifetime. Once chosen by their gang leaders, gang members will relive the fragments of history and valiant battles by foraying into battlegrounds that remind us of the struggle for freedom and martyrdom. The gangs will commence their journey, which begins in March, from Jhansi culminating at the ultimate battleground – Kurukshetra in the bid to find the ultimate warrior who will be crowned the new Roadie! Karan Kundrra, who was responsible for picking members for his gang during the multi-city auditions will not be going on the Roadies journey this year. Instead, MTV VJ and yet another Roadies veteran Nikhil Chinapa will take on the mantle of guiding his gang once the journey commences in March. 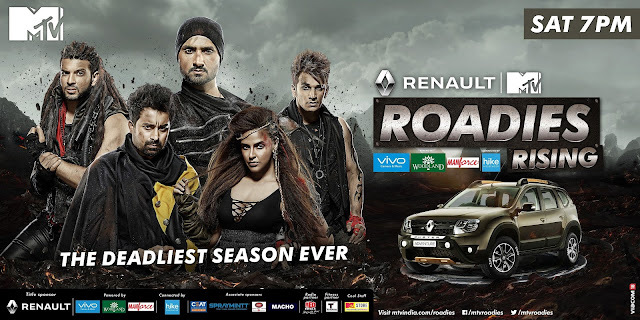 Renault MTV Roadies Rising powered by Vivo Camera & Music, Woodland, Manforce Condoms connected by Hike is all set to kick off this Saturday on MTV at 7 pm with oodles of excitement and more horsepower than ever. Are you ready for the deadliest journey to begin? Unleash the Roadie within you and join forces with your favourite gang leader on the ultimate road to victory with the all new, Roadies Rising!